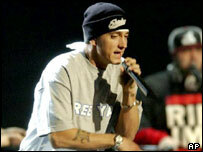 American rap star Eminem has been praised by leading poet Seamus Heaney for his "verbal energy". Mr Heaney, 64, also said Eminem had "sent a voltage around a generation". He made the comment when asked by a journalist if there was a figure in popular culture who aroused interest in poetry and lyrics in the way that Bob Dylan and John Lennon did during the 1960s and 70s. Mr Heaney, former Professor of Poetry at Oxford University, said: "There is this guy Eminem. He has created a sense of what is possible. "He has sent a voltage around a generation. "He has done this not just through his subversive attitude but also his verbal energy." Mr Heaney was speaking prior to the start of the Prince of Wales' Educational Summer School in Norwich, where he was a guest. Eminem, once a controversial figure for his explicit lyrics and court cases, has been widely praised more recently for insight in his songs and for his acting accomplishments. Last year he starred in 8 Mile, the story of a young man who attempts to better himself by becoming a rapper, and he won an Oscar for the film's song Lose Yourself. This year he was named the second most powerful celebrity on the planet in a list compiled by United States business magazine Forbes.